Michael Gove plans to seize around 30 Birmingham Primary schools and turn them into academies. These schools are currently run by the Council. It means that the schools are democratically accountable to us and if the Councillors neglect our schools we can vote them out. Michael Gove wants to hand them over to unelected academy chains, many run by businessmen in the same way they run their businesses. Despite the claims by the government and the media academies are not ‘proven to succeed’. The most recent GCSE results show that 27% have seen their results decline or remain the same. Many academies have relied on NVQs and other exams which have been considered to be equivalent to several GCSEs to improve the position in the league tables. The government have now abolished these equivalents and academies have seen some dramatic falls. The ARK academy in Birmingham, St Albans, fell from 67% to 22% when equivalents were removed. Henry Stewart, a school governor in Hackney, has gone through the figures and has a devastating critique of academies in this video. We need to defend our schools and prevent them being turned into academies. All of our schools should be run for the local community in the interests of local children, not run by a Chief Executive on a Fat Cat salary from some office in Surrey or London. Many of the schools that Michael Gove wants to seize are in areas with high unemployment and poverty. Our children don’t have the benefits that the millionaires in the government can give their children. But this doesn’t mean our schools are failing or underperforming. We all want the best for our children and want them to get the best education they can. Of course some of our schools need improving. To do this they need investment. They need more teachers and teaching assistants. Their governors and headteachers need help in improving their schools. But how does Michael Gove describing some of our schools, and kids, as failing and threatening to sack headteachers, governors and staff really help? 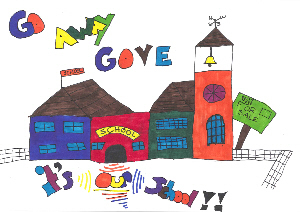 In London, parents, staff and Governors in Downhills School are standing up to the bully boy tactics of Michael Gove. We can do the same. 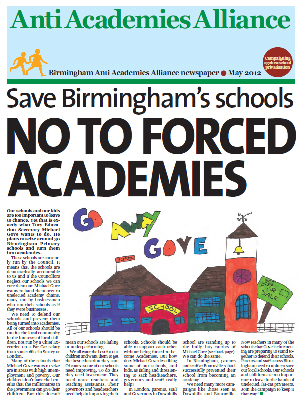 In Birmingham parents and staff at Bournville school successfully prevent their school from becoming an academy. We need many more campaigns like those seen at Downhills and Bournville. Now teachers in many of the schools that Gove is threatening are preparing to stand together to defend their schools. Parents and staff across Birmingham need to unite to save our local schools. Our schools and children are too important to leave in the hands of unelected, fat-cat privateers. Join the campaign to keep it that way! 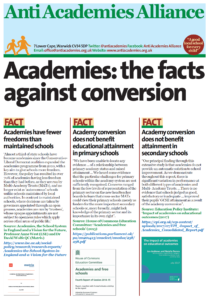 The Anti Academies Alliance is producing a newspaper to distribute at the schools. 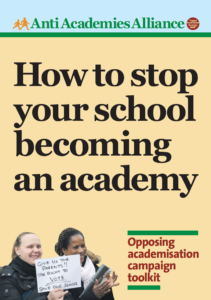 If you are a parent or staff member at the school, or are able to help distribute newspapers and leaflets at a primary school in Birmingham, please contact the AAA on office@antiacademies.org.uk or 07528 201 697. 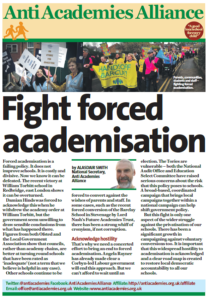 This entry was posted in News and tagged Forced academisation, Primary. Bookmark the permalink. I am reliably informed that at present there are 80 primary schools in Birmingham being forced into academy status.